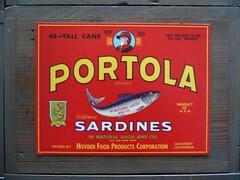 Society for the Appreciation of the Lowly Tinned Sardine: Do You Know The Way To Monterey? We did a dayshot down to the Monterey Bay Aquarium recently. It was extremely crowded, but, we we're constantly delighted. Society High-Lights included the Sardine Roundabout, where you walk into a darkened round room and the little beauties swim in a wheel of a tank above head level built into the wall. the fish rarely change direction. I've been there when the crowds are sparse and it's intense. The Outer Bay, The Kelp Forest, Sandy Shores, Sea Horses, Otters, Penguins and Octopus are all Amazing. Parts of a Tinnery were built into the lobby with videos and displays. It was way too crowded to shoot decent photos, but here are some vintage tins under glass. I like to believe there are still fish in those tins. And, of course, we stopped by the CRSC. I'm starting to lose track of where they all came from. 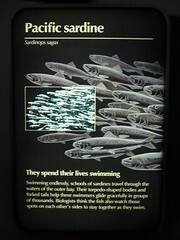 It's great that those are fished in the Monterey Bay and hand packed in Santa Cruz. I wish the price wasn't so outrageous. 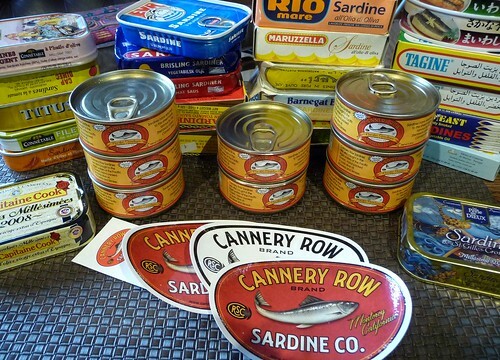 How soon will we have a review of that Cannery Row tin? 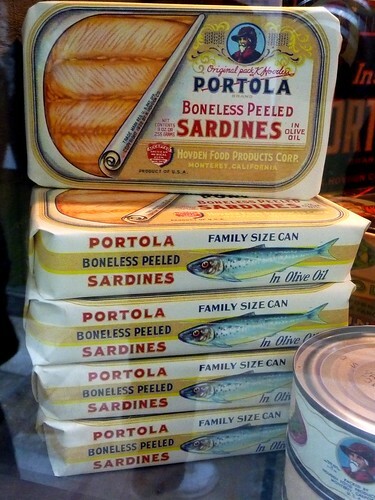 I am speechless - what a wonderful post about sardines - I shall enjoy them all the more the next time I have then on toast!! OH - the shadows were good too!! Wish that video was longer. Sardine room sounds like a fun place to visit. I can´t recall the last time I ate sardines but I really liked to read this post and see the graphics. 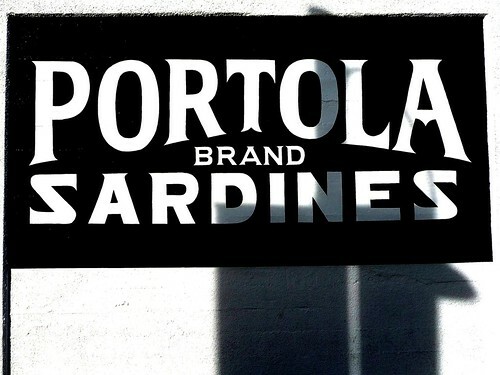 I'm thrilled to have found this site--while we have tended to favor the fresh, whole sardines, having a resource to decipher the many options available in the store is a dream. 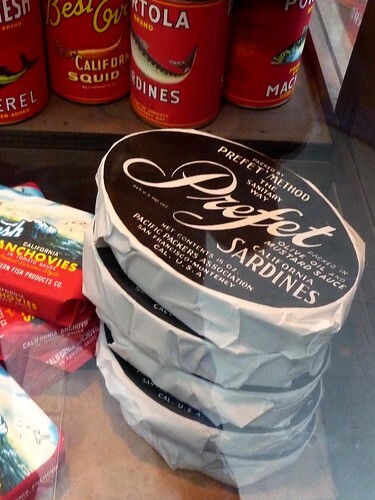 i just discovered your blog and am fascinated by the lowly sardine!